Shields travelled to Miami this week after weeks of camp at the US Olympic Training Center, which is in Colorado Springs, Colorado. “I’ve put my body through so much on this camp,” says Shields, “and now it’s time to start cutting it down a bit. I’m in great shape and my weight is on point. 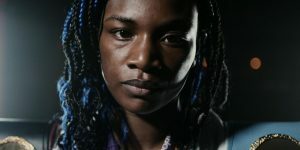 I’m also in a great place mentally and very happy with this camp overall.” With the fight now just weeks away, the 8-0 Shields intends to keep sharp in order to be in prime form for her 24-0 opponent, Hammer.